My name is Helen Tran, and I love designing and creating jewellery. I draw inspiration from history, nature, literature, and cultures from all around the world. 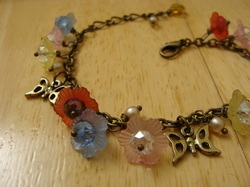 I can make jewellery out of crystals, clay, wire, flowers, fabric, feathers, and much more. I pride myself on creating designs that are colourful, fun, and unique. All my jewellery is made in a smoke-free environment. I split my time between the Niagara Region and the greater Toronto area, depending on where my adventures or school endeavors take me. When I'm not surrounding myself with beads, you can find me writing my novels or playing with my two Siamese cats. This is my favourite medium to use. It packs some serious bling! Epoxy clay is a two-part clay that when mixed, hardens in 12-24 hours to a smooth, hard, finish. While the clay is soft, it can be stamped, pigmented, and embedded with crystals and charms and just about anything else. 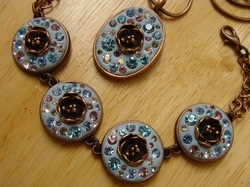 I can use wire to connect beads, charms and bezels. I can also shape wire to wrap semi-precious stones and beads, and create unique pendants. 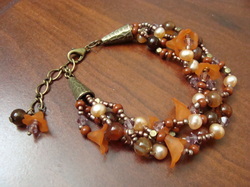 I can create multi-strand and woven pieces. I use semi-precious stones, glass, crystal, and freshwater pearls. This style is excellent for a natural, organic look.